We are the sole owners of the information collected on this site. We only have access to collect information that you voluntarily give us via email or other direct contact from you. We will not sell or supply this information to anyone. We will use your information to respond to you, regarding the reason you contacted us. We will not share your information with any third party outside of our organisation, other than as necessary to fulfil your request, e.g. to post an order. Wherever we collect sensitive information (such as credit card data), that information is encrypted and transmitted to us in a secure way via the world leading payment gateway PayPal (https://www.paypal.com/uk/webapps/mpp/ua/privacy-full). You can verify this by looking for a closed lock icon at the bottom of your web browser, or looking for “https” at the beginning of the address of the web page as you are paying for your items. While PayPal uses encryption to protect sensitive information transmitted online, we also protect your information offline. Only employees who need the information to perform a specific job (for example, invoicing, postage or customer service) are granted access to personally identifiable information. The computers in which we store personally identifiable information are kept in a secure environment. 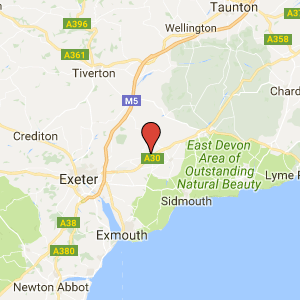 The term ‘Cotley Christmas’ or ‘us’ or ‘we’ refers to the owner of the website whose office is Cotley Farm, Whimple, Exeter EX5 2QR. Our business name is’ The Gateshayes Partnership’. The term ‘you’ refers to the user or viewer of our website. This website contains material which is owned by or licensed to us. This material includes, but is not limited to, the design, layout, look, appearance and graphics. Reproduction is prohibited other than when permission is granted by us.